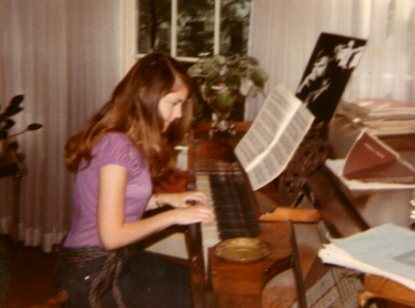 21 year old me appearing to play the piano. The operative word is ‘appear’. When I was in my last year of university in my hometown of Chapel Hill, North Carolina I shared a house with two other students whom I will call Becky and Amanda. There was a third house mate – Stephanie — but only in a theoretical sense. Her parents paid for a room she did not inhabit, having instead shacked up with her English professor – something we regarded as a coup. The only night Stephanie spent under our roof was the one when her parents drove in from Statesville for a visit. The day before their arrival, the professor and Stephanie showed up with a cargo van and unloaded a bed, a dresser and enough clothes, books and stuffed animals to make of the hitherto unfurnished room a kind of Potemkin’s Village – a façade designed to fool her parents into believing her occupancy a reality; the next day, the hoodwinked parents having been dispatched homewards, Stephanie and the professor reappeared, loaded everything back in the van and returned to their steamy love nest. Never once did it occur to us to blow the whistle on Stephanie. She had caught a live one; we admired her prowess. Becky and I shared a room, sleeping on twin mattresses placed on box spring sets on the floor. The other bedroom was Amanda’s. Amanda’s father owned a factory that made the kind of fine furniture featured in Better Homes and Gardens; he was loaded. Her room was furnished with a white Princess canopy bed and matching chest of drawers, bedside tables, dresser and vanity – Barbie would have felt right at home in Amanda’s swanky boudoir. But elegant furnishings and a Daddy with a thick bankroll were not the only reasons Amanda had secured the best bedroom for herself. Her fiancé Randy was occasionally allowed to spend the night – this despite the fact – as Amanda revealed to us with barely concealed horror – that he had hair everywhere. Amanda’s father had promised her the biggest, whitest wedding Charlotte, North Carolina has ever seen when she graduated from UNC. All that she needed to do was find the groom. This she accomplished with alacrity, if not a great deal of discernment. By her sophomore year she had managed to rope Randy, the son of impoverished mill workers, into proposing to her. It took him a further two summers working in the mill to buy her a speck of a diamond ring, which she kept leaving on the open-drained sink in the bathroom. “You left Randy’s ring on the sink again,” Becky and I would say. “Oh?” she would reply, looking at it curiously, as if she thought she recognized it but couldn’t quite place it. “The diamond is so small, it’s as if it’s not there,” she would observe finally, cramming it back onto her knuckle and twisting it into place. Midway through the year, Amanda came home with a white kitten named Little Bit. Little Bit had chronic cat diarrhea, which is, as I discovered, the worst kind. For some reason I cannot now fathom, Amanda located the litter box in one corner of the dining room. For another reason I also cannot fathom, I did not object to this. No sooner had I sat down to my poached egg in the morning, than Little Bit, an inveterate lurker, would burst out from one of his hidy holes and spring to diarrhetic action. To this day, I have issues with poached eggs. The real problem with Little Bit, however, was that he sucked hair — obsessively — and this in a house with three long-haired girls. Amanda solved her problem by not letting Little Bit into her room; Becky and I had a harder time because Little Bit would sneak up to our bedroom during the day and secret himself under one of our box springs, biding his time until Lights Out, at which point he would sidle forth and ravage our locks. After being startled awake one too many times to hot cat breath, the insidious sound of feline sucking and the sight of two cat eyes glowing amber in the dark, Becky and I adopted a pre-bed cat-routing strategy. Then, when Little Bit did not emerge from his lair, we would start – gingerly – to jump on up and down on our mattresses, bantering as we bounced. And so forth and so on, until Little Bit exploded from beneath whichever the mattress he was hiding under and, in a streak of white fur, shot out the door and down the stairs, doubtless to take refuge in the very hidy hole from which he would emerge eight hours later to savage my breakfast. I associate Amanda’s wedding with the end of my life in the South. Three months later I would go north to Toronto to pursue an M.A., along with the M.R.S. that I, unlike my more resolute house mate, had failed to secure after four years of university. I would never return to the South, but would live out my days not just in the North, but the True North — in Canada. Wedding Belles, published in 2002 in the North Carolina Literary Journal, is based on Amanda’s wedding; but it’s also about what it felt like to be a girl of ‘marriageable’ age at that time in the South – like being trapped inside an unreliable, old pressure cooker about to blow. To read Wedding Belles, click on the title.